There’s an LA Times story floating around about a pretty remarkable UCLA medical student. Well, not medical student anymore, she’s probably Dr. Lim by now considering UCLA’s graduation/Hippocratic Oath ceremony has come and gone. But whatever her title her’s is a truly encouraging story. But from that suffering, Lim forged a life of achievement. On Friday, she will graduate from UCLA’s medical school and then will begin a residency program at the medical center there. Colleagues say Lim’s calmness in a hospital’s hectic environment puts others at ease. “With Kellie, at first you notice her hand is not there. But after about five minutes, she is so comfortable and so competent that you take her at face value and don’t ask questions so much. 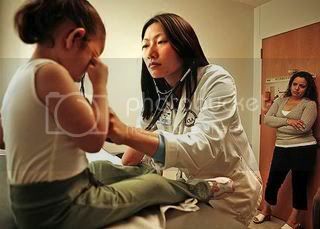 She has an aura of competence about her that you don’t worry,” said Dr. Elijah Wasson, who supervised Lim during a rotation in internal medicine at Olive View-UCLA Medical Center in Sylmar.